- 1976 - First boxing trainings in gym "brothers Sconfietti", FPI (Federazione Pugilistica Italiana) in Pavia. 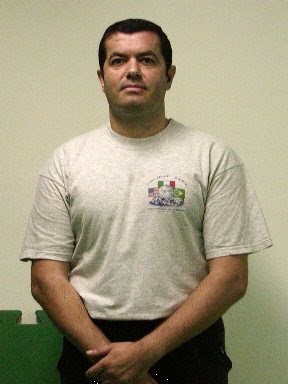 - Three years later teached savate by Maestro Emilio De Alessandri. - In 1986 after 7 years of praxis, he got SAVATE diploma in savate organization called ENBF (Ecole Nationale de Boxe Francaise SAVATE) from savate master Manusardi pionir of french boxing SAVATE in Italy. - At the end of 80's he attended many seminars in Doria Totip gym in Milan and cooperates with many fighters as Andre Panza, Fred Royers, Rob Kaman, Tom Harinck, Peter Aerts, Ramon Dekker. - In 1994 he got diploma from savate organization UIBFS, that was recognised from FIS savate. - Nowadays he works (attend seminars) in Jeet Kune Do with great names - Dan Inosanto, Paul Vunak, Tomas Cruise, Mark Danny the Dog Brothers and Roy Harris. and his pupils achieved 4 titles of Italian BF SAVATE combat champions and WKA, ISKA regional titles.